Huawei, the globally acclaimed Tech giant from China has unveiled two most lucrative accessories which are the need of the hour- quick chargers. The quick chargers can charge to full in few minutes. One of the quick chargers can charge up to 68% in 2 minutes whereas the other can charge up to 48% in 5 minutes using bespoke chargers. The specialty of the former one is the extremely small time required for charging, but the charge is not enough to standby in a smartphone for long time. The latter one may take comparatively longer time to charge up but can provide 10 hours talk time, as claimed by Huawei. Moore’s Law, that has brought about phenomenal revolution in the world if modern technologies, said that transistor complexity will increase in every 6 months. Now that high end smartphones are in our hands, the increased complexity in the smart devices claim stronger batteries. The strength of the batteries required to complement the modern era smartphones can be achieved in two ways- one by inducing quick charge technology in the charging adapters and the second by using a replacement for silicon in chargers. Researchers are working on the use of graphene and aluminium in place of silicon. 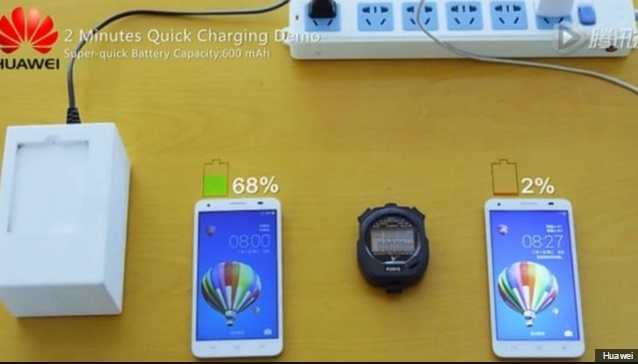 Samsung introduced the fast charging technology or quick charge technology in Galaxy S6 and Note 4 that can provide 4 hours of usage after 10 minutes of charge. “Everyone in the world – consumers and all the manufacturers – would benefit from some unforeseen breakthrough in battery chemistry technology,” Motorola president Rick Osterloh told in an interview. He also talked about the famous Moore’s law and its relationship with battery. “At the moment everyone is getting interesting incremental benefits from changes in lithium-ion batteries but fundamentally there hasn’t been a Moore’s Law type curve for battery improvements and I think that would be something everyone would benefit [from].” Let’s see how Huawei turns up with its latest two quick chargers.